Pratt and Lambert is the flagship paint line at Chuck's Paint and Blinds. Pratt and Lambert is a company founded over 150 years ago in Buffalo New York. Through the years, the Pratt and Lambert name has been associated with high quality. During the 1950's Pratt and Lambert distinguished itself as the color leader in the paint industry with innovative calibration methods used to coordinate color schemes. In 1980, it introduced premium Accolade brand paint. Accolade won recognition for its superior performance in the 1990s when a leading consumer testing organization called it the best performing latex paint in the market today! 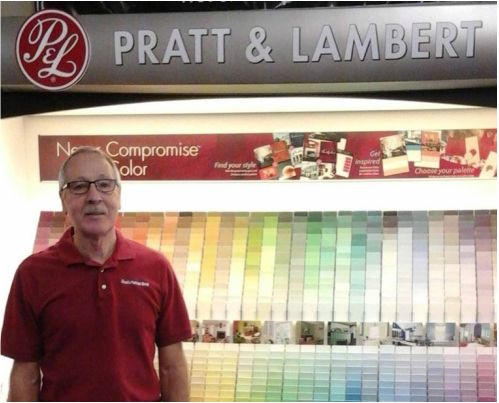 In 1999, Pratt and Lambert celebrated its 150th anniversary, marking more than a century of providing the finest paint products to the marketplace, with a renewed commitment to dealers, contractors, and consumers. When it comes to quality, NEVER COMPROMISE. We are also introducing a new line of paint at Chuck's Paint and Blinds. we will be offering Benjamin Moore products in addition to the Pratt and Lambert line. We recognize there are customers who have been loyal to Benjamin Moore and we would like to be able to serve them. It is important to note, like most products, Benjamin Moore offers several lines of quality. Chuck's will not compromise quality in our inventory as we reach out to Mitchell and the surrounding area with our newest product line, Benjamin Moore. We will be the exclusive source for high quality Benjamin Moore paints. Chuck has been in the retail construction business for over 30 years. His product knowledge and customer service is unsurpassed in this area. You can "Ask Chuck" and the chances are good that he will have a professional and knowledgeable answer for you. Chuck offers color consultation and down to earth advice on color selections. Our staff has unlimited ideas and if necessary, will come to your house or business to give you the best advice. This a free service offered to our customers. Bring in your colors and Chuck's Paint and Blinds will match it for you. Store hours are 7:30-5:30 Monday - Friday and they are open until 2 PM on Saturdays. Any other times would be by appointment.